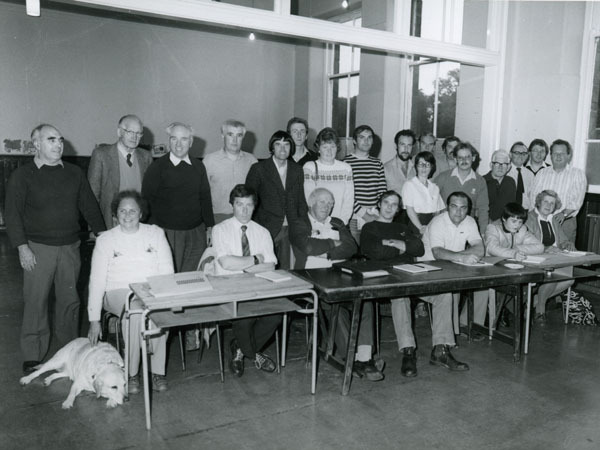 The Wigtownshire Amateur Radio Club was founded on October 14th, 1980 with an inaugural meeting held at the Red Cross Hall, Glen Street, Stranraer. Club Members from the early days. How many faces can you still recognize? Jim Hopkins GM4LPT is 4th from left. Ian Macdonald GM8AVM and Andy Ronnie GM6WAZ are still regular attenders. The founder members were John Bray GM6FPD, Jim Hopkins GM4LPT, Neil Macdonald GM4LQS and Gerry Maxwell GM4BAE. Attendance was said to be disappointingly low, but reading from the minutes of the meeting it appears a basis for the club was formed, a venue was also agreed on and a date for the next meeting. Since then the club has gone through the usual ups and downs and at present has a membership of around 60 with ages ranging from about 11 to eighty-something. Members come from all over the region, with some travelling in excess of 150 miles most weeks. Some live outside the area and visit when they can, and holiday-makers are always made welcome. 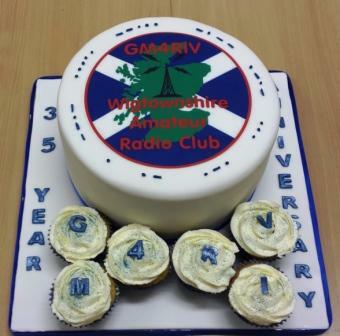 We are twinned with the Bangor and District Amateur Radio Society in Northern Ireland and the two clubs meet as often as possible. These meetings are either at club premises or at rallies here in Scotland or in Ireland. In 2015 we celebrated our 35th anniversary, and a commemorative certificate was given to Founder Member Jim Hopkins GM4LPT (now silent key) who lived near the clubroom and still attended all meetings until shortly before his passing in 2018.